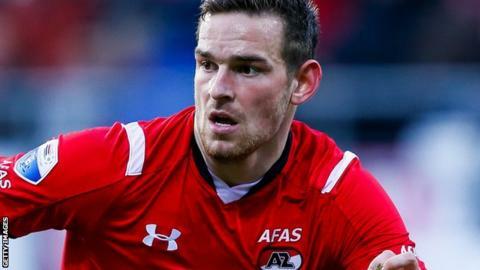 Dutch top-flight club AZ Alkmaar have rejected a bid from Tottenham for Netherlands striker Vincent Janssen. The 22-year-old finished last season as the top scorer in his homeland, netting 27 goals in his first campaign in the Eredivisie. AZ wanted 20m euros (£16.15m) for Janssen but De Telegraaf reported Spurs had only offered 14m (£11.31m). "The difference between the offer and the price we demand was too big," said AZ technical director Max Huiberts. "I've read a lot of speculation and been telephoned by other clubs but no-one else has made any concrete offer." He added Janssen visited London with his agent but has also held talks with Bundesliga club Wolfsburg. Janssen has scored three goals in five international appearances, including a penalty in a 2-1 victory over England at Wembley in March.